Europa is the closest and probably the most promising target to perform a comprehensive characterization of habitability and search for extant life. Years to come will see several missions aiming to bring answer to these questions. Europa Clipper and JUICE, currently in phase B, have planned to achieve fly-bys, and several mission concepts to land on Europa surface have been studied. An advanced mission concept the Joint Europa Mission (JEM), has been proposed to ESA Comsic Vision programme in 2017 in order to provide an ESA-led Europa orbiter carrying a NASA-led Europa lander aiming at understanding Europa as a complex system responding to Jupiter system forcing, characterizing the habitability of its potential biosphere, and searching for life in its surface, sub-surface and exosphere. 1. By performing a fly-by at an altitude and a location not achievable by the carrier plate-form, allowing for sampling plume materials if this rare opportunity to access the sub-surface ocean chemical compounds occurs. 2. By performing orbits around Europa at low altitude orbits to cross a potential plume when detected by the orbiter, as well as environment studies. Flying a CubeSat in the Jupiter/Europa environment constitutes a significant challenge. The strong radiation belts surrounding Europa require to be mitigated as the state of the current rad-hard components for Cubesats still not reach the level of components used for traditional platforms. In addition the 5.2 AU separating Jupiter from the Sun induces intricated constraints on power supply, thermal regulation as well as data transfer. 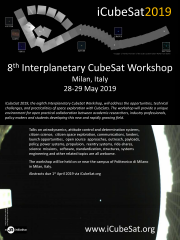 In this paper, the 12U CubeSat named EPIC (Europa Plume Investigation by CubeSat) will be presented. EPIC is primarily designed as an augmentation to the JEM mission concept while remaining compatible with fly-by missions (Clipper, JUICE). EPIC scientific objectives are to study in detail potential Europa plumes through in situ plasma measurements, as well as characterize in detail Europa’s magnetic and particle environment. Taking into account both the scientific objectives and environmental constraints of the mission, the preliminary design of EPIC reaches a mass budget of 24 kg and represent a total additional mass of around 45kg for the carrier (deployer, wide-angle camera for plume tracking). In the other hand, this cost allows to provide unique science return by giving scientists valuable information about Europa’s habitability.